These seats will fit the majority of sit on top kayaks providing that there are 4 attachment points - 2 forwards of the seating position and 2 behind the seating position. These may be in the form of d-rings, plastic pad-eyes or moulded-in clip points. Universal fit seat for any Sit On Top Kayak. Also features a rear zipped pocket. The Feelfree Deluxe provides additional comfort compared to a standard seat, with increased padding on the seat base and backrest. 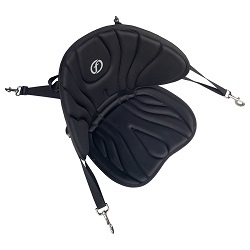 Four Snap Hook attachment points ensure that the Deluxe seat can be easily removed and re-fitted. 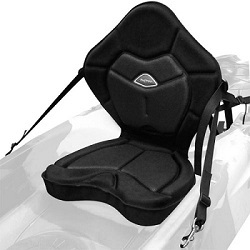 The Feelfree King Fisher seat provides the ultimate comfort for sit on top kayak fishing. 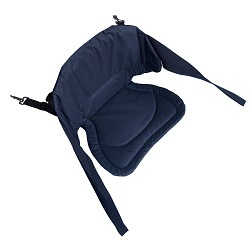 It has a dedicated conjure lumbar cushion gives the extra support in the lower back area.